Housewares are perfect for making up a dedicated Sonic room, or adding a cool Sonic theme to your room or house. General household items can also appear here, it's not just limited to rooms or bedrooms. 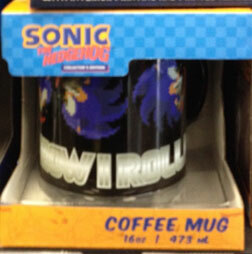 You might find Sonic stuff for your kitchen, bath, or almost anywhere! This page will have a mixture of new and vintage items, each should list what era it's from, and will list where it can be found, whenever possible..
Of great Sonic detail, that is! It is completely covered in Green Hill Zone themed design both on the outside, and the handle, but also on the entire interior too! Then, when the drink is finished, there's a special surprise design of a star bumper at the bottom. It is done in the 16 bit pixelated style, with jumping Sonic sprite on one side, among sunflowers, palm trees, rings and clouds. Notice the palm tree is on the handle as well. The inside appears to just have palms, but it seems to be difficult to photograph. This is a larger than normal mug, at 20 ounces of liquid. It is a Spencers' Gifts item in summer 2017, & should be sold both in stores and online. 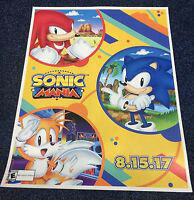 The 2017 San Diego Comic Con SDCC had their own exclusive poster to promote Sonic Mania. It was likely a booth prize of some kind. The event was the only place you could get this neat poster, so it is sure to be uncommon. It has the game's logo, bright colored lines & shapes and a portrait of each character. Knuckles in a desert area, Sonic in a Green Hill & Tails in a night time zone. The Tails art appears to be new, with him either saluting or 'looking out' over something. It also has the game's release date 8.15.17 near the bottom. Colorful, fun & exclusive, it's a great item for the wall of your Sonic room. 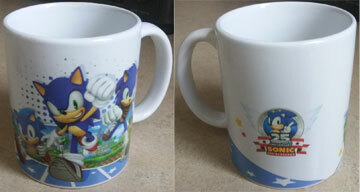 A cool mug for Sonic's 25th Anniversary! **POSSIBLE Paint Problem? Report now in that the paint on this mug MAY be fragile & start to flake. It seems isolated to this one design, is it a defective mug or are there more issues? Write in if you've had any trouble with this mug. Here's another mug by Vandor. This is the "I'm Outta Here" ceramic mug. It's all blue, with a big design on both sides. It has forward facing Sonic face (no outline) for one side & 'getting ready to run' classic Sonic on the other, with a yellow background and the new (increasingly common) slogan written in dark yellow, on a yellow background. This is a big mug, its 20 ounces. It should retail at about 9.99, and is a summer/fall 2017 item. Here's a Hot Topic insulated layers plastic cup. This drink cup has two walls, with a gap of air between to help insulate your drink and cut down on condensation. 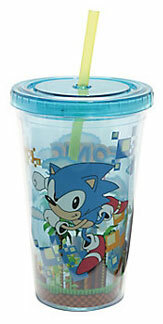 The design of the cup also takes advantage of the construction, putting neo-classic Sonic stock art on the outside layer with some squares & designs, then adding a 16 bit style pixel Green Hill zone on the inner layer. The two layers make the whole design look 3D, like Sonic is leaping out from the background. The opposite side has more squares, and the classic style logo. The cup also has a blue tinted lid, and yellow re-use-able plastic thick straw. With good use of design, neo-classic art & good construction this cup is cool while cooling your drinks. A good collectible, seen in summer/fall 2017 at Hot Topic in stores and also online. 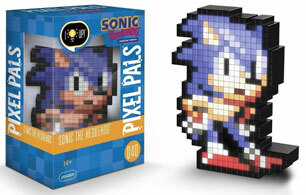 This is a "Pixel Pals" room light! These should be about 14.99, and uses AAA batteries. It's for sure sold on Amazon, but where else might you find one? 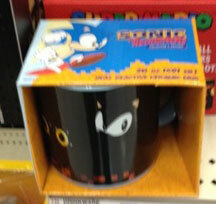 Where's Sonic on this mug? He's hidden in plain sight! This is a "heat changing" mug, where, when you pour hot liquid into it, the black coating 'dissappears', revealing hidden designs! Obviously, with the eyes & ears showing there, you can tell exactly where Sonic will appear...but not what pose he's in. There are also rings, and the 'ground' checkering indicates that Green Hill elements will also likely be revealed. It looks like the handle and interior are likely light blue. Here is another mug for 2017. Here are 3 different fleece blankets, each of which has 2 different patterns. Interestingly, there are 2 for Tails exclusively, and 1 for Sonic. (Generally it's the other way around) The Sonic one is dark blue, & features thumbs up modern Sonic faced partially away in a giant gold ring with the modern logo at the bottom. It's back side has a close-knit pattern of only green simple chaos emeralds. The first Tails blanket has a borderless classic Tails happy face on an all-orange background. (Impossible to tell where his face ends/begins as an art-choice) The back has different 16 bit type sprite art of spinning, jumping & flying Tails repeated all over as a pattern. The last blanket is also dark blue & has the 25th anniversary wing-ring logo but this time with title-screen-classic Tails in the logo instead. The modern Sonic logo also looks modified to have Tails' name in there instead. The back is another busy pattern of just his face (all the same face) in a 16 bit type pixel style. These are Segashop items, and they're all oddly quite expensive at 54.95 PER blanket. Are they huge? Are they double-thick? Why so costly? When people can walk into a Target or Walmart and pick up a fleece for 15 or 20 dollars in a similar size, fleeces like this start to raise questions in 2018. Here's a cool water bottle with a surprise inside that will keep your drinks extra cool! 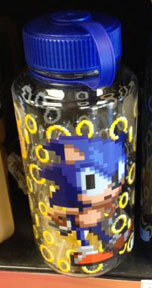 This clear plastic water bottle with blue cap has 16 bit style pixel 'foot tappin' Sonic with a busy background of pixelated rings. That's pretty standard stuff. But, look inside at the bottom there...and you can see something yellow. This is called the "Let's Roll" mug. 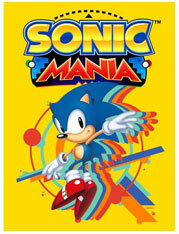 This is a Sonic Mania poster from the online Sega Shop. The Sega Shop is probably the only place this is released in 2018. It's standard poster sized (so, big) & fairly simple, with the Mania logo large at the top and the neoclassic 'box art' for Sonic with geometric shapes as the main design on a yellow background. This is probably what they were thinking the 'box art' would have looked like, had the game ever been a physical item. It's been seen before, but it makes for a stylish game room poster with plenty of bright color & a good action pose for Sonic. It should be 15.95 at the Sega Shop website. Amy gets her own mug! 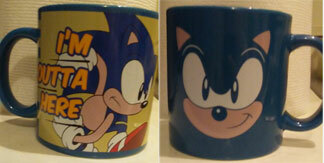 This ceramic mug has a terracotta colored interior, and stars only Amy Rose! It's classic style Amy, with a streak and fancy blue snowflake background. She's shown totally in profile, almost 'sprite like' from a game, running or walking along. The mug exterior is white, with the snow design on all sides. It's a cute mug that looks fresh for Amy fans! This is a Sega Shop exclusive item for winter 2018 / 2019, and should be about 20.00 when you find it. It's a bit costly for an ordinary mug, but, it does have an all new art and a decent design effort. Plus, Amy Rose doesn't get to star in many things by herself, so this is a nice example of Amy merch.